This LED indoor spotlight is an industrial pendant luminaire, which can be used as a basic lighting in warehouses, halls, production halls and open stables with a height of 5 to 8 meters. The LED luminaire replaces HID luminaires from 50 to 200 watts, which makes minimal energy savings of 50% possible. This luminaire was measured according to the LM-79 and LM-80 techniques and has an efficiency of 120 lumens per watt. This is achieved by Japanese BRIDGELUX SMD chipsets and a Meanwell power supply. With no maintenance and replacement costs and energy savings, a short payback period is guaranteed. 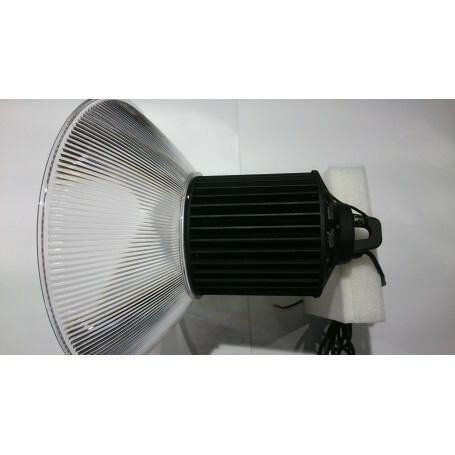 The high bay luminaire comes with 0-10V dimmable internal power supply, acrylic screen with 90 ° beam angle and mounting accessories. Gray or black case. All luminaires are the result of optimized production processes, rigorous quality management and in-depth market research. The products have been tested according to the standardization guidelines of the International Electrotechnical Commission (IEC) and comply with the European guidelines for interior lighting EN-12464-1 and come with a 5-year warranty. For all DUOLED products, quality can be taken for granted thanks to the CE, EMC, ENEC and TÜV-GS certifications.